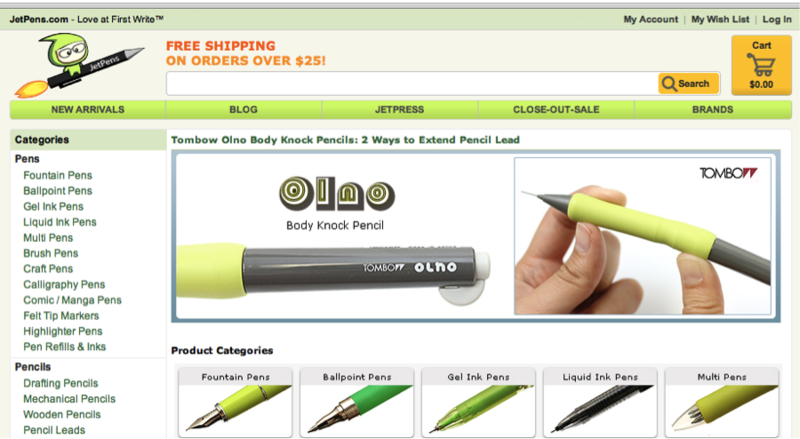 Jet Pens is an internet retailer of pens, other writing instruments, and office supplies of Japanese and European origin. Their shipping warehouse is located in Northern California, but they operate exclusively online. The site features an extensive catalog of writing instruments and related products, a blog, product rating features, a shopping cart, search, a wish list feature, and the ability to create an account. The site has a clean, cohesive look, with a green theme color for text and graphics, a minimalist Japanese-style cartoon mascot, and high-quality photographs. The site features several ways to search, including a listing of categories in both text and photograph, in addition to offering search. The tone of the site is professional but friendly, and the copy is consistent and well-edited. The audience appears to be stylish and artistic people, likely between the ages of 20 and 40, who work with or have hobby interests in drawing and visual design, and who like high-end, stylized office supplies. This audience is likely to be somewhat affluent. Generate revenue through selling pens and office supplies, with the competitive advantage of a wide selection, good customer service and site design, frequent new product offerings, and high-quality, hard-to-find imported products. The site offers specials, giveaways, and other incentives for customers to return frequently and purchase more. 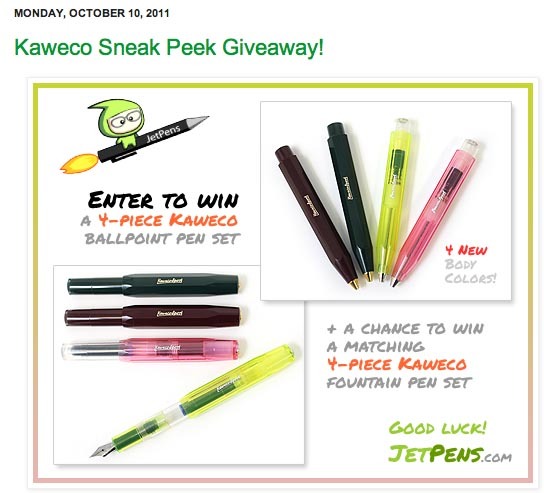 Jet Pens has a Facebook page and a Twitter account (@Jetpens), and links on their site allowing users to share Jet pens out to their own social media stream on these two networks. They also have a Flickr account http://www.flickr.com/groups/689868@N22/ and a YouTube channel that contains product reviews http://www.youtube.com/user/JetPens.